I am writing from Lima, Peru, where the 20th Conference of Parties (COP) for the United Nations Framework Convention on Climate Change (UNFCCC) was supposed to be coming to a close... there has been wrangling all night, the closing plenary of the Ad Hoc Working Group on the Durban Platform for Enhanced Action (ADP) has finished without a concrete result. The COP President Manuel Pulgar-Vidal was meeting with countries and country blocs to see if agreement can be reached before decision-makers return home. 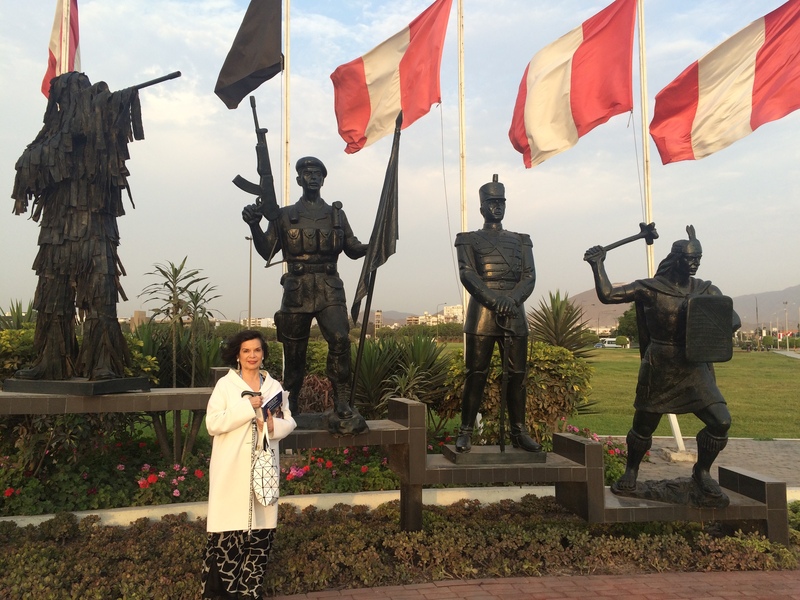 Over the past thirteen days world leaders and representatives from 195 countries, members of the business community, academics, NGOs, indigenous and grassroots organisations, a total of over 12,000 international visitors have descended on Lima. The aim of COP20 was to establish what each country's 'contributions' in the fight against climate change should look like. These 'Intended nationally-determined contributions', (INDCs in UN parlance), should form the basis of the global climate agreement that is expected to be finalized at Paris in 2015 at COP21. I have not been optimistic about the outcome of COP20 from the start. I fear this UN climate conference will go down in history as the COP which failed to make provision for the poorest and most vulnerable, that failed to protect the rights of indigenous people and local communities; that postponed REDD+ negotiations, and failed to promote gender equality. There is hardly any provision for disabled people at the COP and woeful provision for those who, like me, have an injury. There were no lifts that I could see, and getting from place to place involved long walks in the heat. I walk with a stick. I found negotiating the COP difficult, so I can only imagine the challenge it presents for those who are disabled. Most of the events relating to indigenous communities took place at the Maloca, the Indigenous Pavilion, which was in the 'Jockey Club,' a horse racing track about a mile from the main COP. The Maloca was the only area I visited that was deprived of wifi - a tool crucial for networking, negotiating and decision-making. Getting to and from the Pavilion for indigenous events was not easy. There were no buses from the Maloca to participants hotels - we had to return to the Pentagonito and take a bus from there. 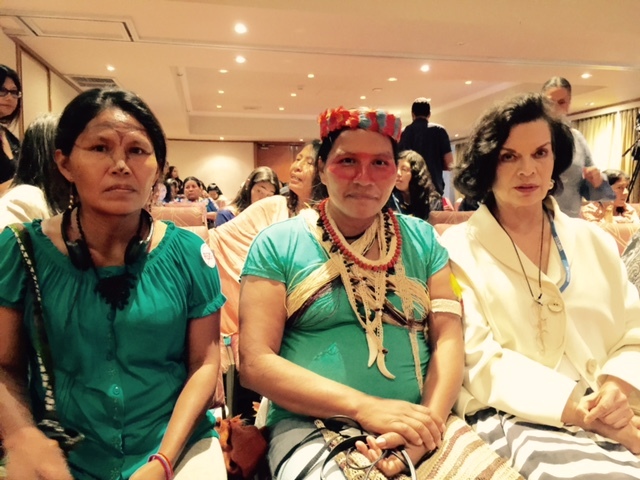 Indigenous people are present in force at COP20 but tragically their voices are not being heard. At about 2 am this morning, Lima, Peru time, a new draft text of the ADP was issued that could form the basis of an agreement in Paris. The decision text is fatally weak, does not respect the principles of the UN Framework Convention on Climate Change, is vague on financing, unbalanced, and overly focused on mitigation. The concept of differentiated responsibility is being diluted by new terms. Language relating to 'loss and damage' which is critical for developing countries has been removed. In short it is a poor basis for an agreement in Paris. All these shortcomings will affect developing countries and poor communities in disastrous ways. At 10.40 am this morning, the closing Plenary began, where countries responded to the text. Some including Malaysia, Sudan, Tuvalu, China, Cuba, Oman, Pakistan, my native Nicaragua and South Africa among others objected to the text, and refuse to accept the agreement as it stands. These countries called for negotiations on the text of the agreement to continue directly under the Peruvian COP President Manuel Pulgar Vidal. I was very surprised that after eloquently lamenting the loss and damage language, the Philippines agreed to accept the draft ADP text as it stands. Singapore described a lack of trust: the draft text is deviating from the Convention, there's backsliding on finance and commitments from developed countries. The ADP draft text has now been passed to the COP for further revision, under the supervision of President Pulgar-Vidal. The aim is to achieve a consensus today. He meets all blocs for 10 minutes each. He stated this morning, 'This is not a moment for proposals but for solutions. Let's work together.' We'll see. Human rights are not mentioned in the ADP. It is both inexplicable and unconscionable that the concept of human rights has been omitted from the draft text. 'A safe, clean, healthy and sustainable environment is integral to the full enjoyment of human rights, including the rights to life, health, food, water and sanitation.' Climate change, and the harms it will cause, are fundamentally issues of human rights. Ghana and Mexico supported the addition of human rights language. Unfortunately I fear, there is now very little chance they will prevail. I cannot fathom why more countries did not support the addition of this language to the ADP. On the 10th of December - International Human Rights Day - the Special Procedures Mandate Holders, the largest body of independent experts in the United Nations Human Rights system, issued a statement urging Member States to integrate human rights standards and principles in the climate negotiations. It's critical, their statement continues, since 'impacts of climate change interfere with the effective enjoyment of human rights. In particular, climate change has a disproportionate effect on many disadvantaged, marginalized, excluded and vulnerable individuals and groups, including those whose ways of life are inextricably linked to the environment.' (my italics). It seems they were not heeded. In the language of the Advanced Durban Platform decision text it appears that preambular language referencing "human rights and the rights of indigenous peoples" has been removed. I have attended COP13 in Bali, COP14 in Poznań, COP15 in Copenhagen, COP17 in Durban, COP18 in Doha, COP19 in Warsaw and will hopefully attend COP21 next year in Paris. I truly hope that the UNFCCC will be able to achieve a global, legally binding climate deal next year but I have reservations. COP15 in Copenhagen should have been a turning point. It was a unique opportunity to set the world on the right path to avoid catastrophic climate change. For two days, most of the world's leaders congregated under one roof for a common purpose. Attended by 119 Heads of State, COP15 was the largest gathering of its kind held outside of the annual UN General Assembly in New York. The highlight was the attendance of US President Obama. The two weeks of meetings, extending late into the night, marked the culmination of two years of intensive negotiations. The conference was the focus of unprecedented public and media attention. And yet, the result - the Copenhagen Accord - was a shameful compromise. The words "legally binding" were conspicuously absent from the three-page text of the Copenhagen Accord. The Accord was merely "politically binding" for those countries that chose to sign up to it. Furthermore, it did not set emissions reduction targets for either 2020 or 2050, nor did it set a deadline by which the action points should become legally binding. The French newspaper Liberation lamented the speed and commitment to saving the planet compared with saving the global financial system: "We must make the bitter observation: when it comes to rescuing the banking system, the dialogue has been far more effective and determined. It is clearly easier to save finance, than it is to save the planet." Since COP15 expectations have been declining steadily with each conference. At COP20, they are at an all-time low. After having seen the discussions in the Plenary this morning, I wonder how much we've learned since Copenhagen. 2014 will probably end up being the hottest year since records began in 1880, according to the National Oceanic and Atmospheric Administration. We have already matched 1998's temperatures, previously the warmest year on record. Time is running out. Inaction will lead to severe and irreversible damage. Climate change will affect everyone, everywhere, in every nation and in every echelon of society in the developing and developed world. We will all suffer the catastrophic consequences of: rising sea levels, desertification, food and water scarcity and political unrest. But some of the most vulnerable communities in the world are bearing a disproportionate burden of the harm without having significantly contributed to the cause. This is a terrible injustice. Hearing delegates' responses to the ADP text this morning, reinforced my opinion that there is a bias and injustice inherent in these negotiations. Failure to acknowledge different countries' different responsibilities can only end in failure. A comprehensive, legally binding, global climate deal must make provision for the rights of all and acknowledge that some countries are more responsible for climate change than others. We must achieve Climate Justice, a recognition that climate change will disproportionately affect people who have less ability to prevent, adapt or otherwise respond to increasingly extreme weather events, rising sea levels and increasing resource scarcity. The COP has always drawn lines drawn between the 'haves' and the 'have nots', between so-called 'developing countries' and the developed world, between the 'global north' and 'global south.' The climate talks are often fraught with bias and discrimination towards the global south, women, indigenous people and the poor as well as protesters. Their voices and that of civil society are often ignored in negotiations. Sometimes even freedom of expression is curtailed at the COP, as we have seen here this week. COP rules require protesters to submit their banners and slogans for approval, and prohibit the mention of specific names, officials and projects. Alyssa Johnson Kurts, with the US youth delegation SustainUS told Democracy Now, "We tried to submit a banner that would have an arrow with Keystone XL in one direction and a liveable future in the other direction, and they rejected that proposal," she says. In contrast, very few restrictions are placed on the fossil fuel companies that come to the COP. Corporations and fossil fuel companies have always had a presence at the negotiations. Yesterday, December 12th, 350.org delivered a petition with 53,000 signatures to the COP organisers, calling for fossil fuel corporations and their lobbyists to be banned from the negotiations. REDD+ (Reducing Emissions from Deforestation and Forest Degradation) was identified as a key area of focus for Lima. COP20 President, Manuel Pulgar-Vidal, announced forests as a critical theme and set the goal of realising "progress made in regards to the role of forests (REDD+)." REDD+ is our opportunity to make a global commitment to forest conservation and enhancement of forest carbon stocks. It is critical that these developments should respond to the concerns of indigenous people and guarantee full and effective participation of indigenous peoples in all processes, programmes and actions at all levels, including their access to funding mechanisms, financing and capacity building. This must include a robust and enforceable system of social, environmental and human rights safeguards. REDD+ is beset by a fundamental difference in thinking. Some see REDD+ as an important framework that will bring both forest preservation and will benefit indigenous tribes. Rainforest Foundation Norway for example has "a rights-based approach to rainforest protection. We believe that the peoples who for generations have developed their cultures and societies in balanced interaction with the highly complex yet vulnerable ecosystems of the rainforest have fundamental rights to these areas. Legal recognition of the collective territorial and cultural rights of forest-based peoples and communities is crucial to the fulfilment of their human rights. It is also a major prerequisite for protecting the rainforest." Unfortunately there is another school of thought, dangerous dissenters who see REDD+ only as a profit making new market that exists to be exploited. The negotiations and decision-making should have been easy - protecting and advancing the land rights of indigenous people will advance their human rights protections and will also reduce cumulative carbon emissions through healthy and flourishing forests. But the REDD+ negotiations at COP20 collapsed. Climate justice remains a long way off. I gave the keynote address at the REDD+ Implementation Working Group: Legal and Governance Foundations, Indigenous Peoples Rights and Safeguards on December 5th... Morale was low among the negotiators, and sure enough, negotiations reached a deadlock, or REDDLock, and came to a complete halt that Friday here in Lima. The REDD+ talks broke down in part because there has been no agreement on guidance for the safeguards. Countries like the United States and Norway were pushing for more clarity on how these safeguards are reported, but nations like Brazil and Panama among others claimed guidance would be burdensome, slowing implementation of forest protection measures. Shamefully, there will be no concrete outcome on forest protection at COP 20, despite this COP being held in Peru, one of the world's largest rainforest countries. Deliberations have concluded for this session. Once again, a critical decision regarding indigenous rights and environmental protection has been postponed until the next UNFCCC inter-sessional meeting in June 2015. Time is running out. 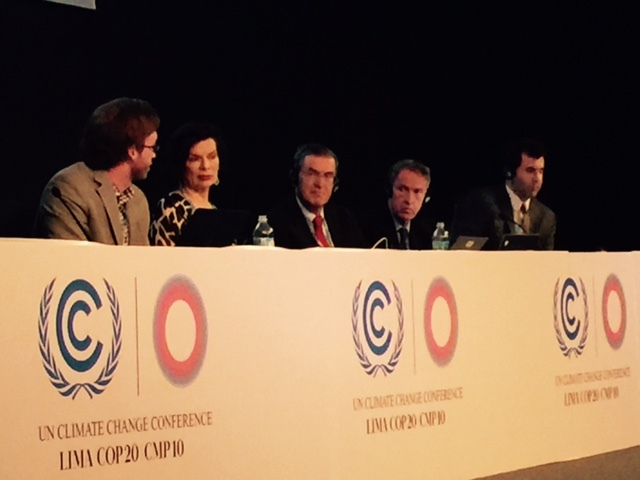 As I said in all the five presentations I made at COP20, forests of all kinds are essential to our future. The Amazon in particular is home to about a third of our planet's terrestrial life forms, cycles nearly a quarter of the Earth's freshwater, absorbs around 2 billion tons of carbon dioxide per year and plays a vital role in moderating the climate. More than 1.6 billion people depend on forests for food, water, fuel, medicines, traditional cultures and livelihoods. Forests support up to 80% of biodiversity on earth and play a vital role in safeguarding the climate by naturally sequestering carbon. Globally, deforestation accounts for up to 18% of greenhouse gas emissions, or roughly 5.8 billion tonnes of CO2 equivalent released into the atmosphere, each year. This is more than global transport and aviation combined. According to the Stern Review on the Economics of Climate Change, reducing deforestation is the "single largest opportunity for cost-effective and immediate reductions of carbon emissions." The organisation I founded and Chair, the Bianca Jagger Human Rights Foundation (BJHRF) and I are committed to forest conservation. That is why, in 2012, I became IUCN Ambassador for the Bonn Challenge, the largest restoration initiative the world has ever seen. The objective of the Bonn Challenge is to restore 150 million hectares of degraded and deforested land across the world by 2020. There are 2 billion hectares of degraded and deforested land across the world with potential for restoration. Restoring 150 million hectares would capture 47 Gigatonnes of CO2, and reduce the emissions gap by 17%. Forest restoration is invaluable in the race to tackle climate change. Already more than 51 million hectares of land have been committed to the Bonn Challenge, from the following countries: United States, Rwanda, El Salvador, Costa Rica, the Brazilian Mata Atlantica Restoration Pact, the Democratic Republic of Congo, Uganda, Niger, Colombia, Ethiopia and Guatemala. During my participation at COP20, I spoke at several events that addressed the issue of indigenous people's rights, their land and the forest. On December 8th I spoke at the Indigenous people's Hearing on Deforestation and Indigenous Peoples at the Museum of Art in Lima, and the Tri-Caucus and Human Rights & Climate Change Working Group celebration of the first ever Human Rights Day at the UNFCCC on December 10th. I heard many moving testimonies. At both events, there weren't enough translators, or enough headphones to go around, and many of the audience didn't speak English - so I did my own translation and switched between English and Spanish throughout the speeches. For most of my life I have believed that in order to tackle climate change, we need the forests. In order to protect the forests, we need indigenous people: their wisdom and knowledge. Indigenous people should be at the centre of climate change negotiations. They have been proven the best custodians of ecosystems. A report released on the second of December, titled 'Forest Carbon in Amazonia: The Unrecognised Contribution of Indigenous Territories and Protected Natural Areas' proves what I have long known: that indigenous territories achieve nearly one third (32.8%) of the Amazon's carbon storage - equivalent to all of the forests in the Democratic Republic of Congo. The Belo Monte dam in 2014. When I visited in 2012, this was still a river flowing through a rainforest. I was hoping that COP20 in Peru, the heartland of many indigenous tribes. would be the conference where we were finally going to address the issue of indigenous people's rights. Tragically indigenous rights are being violated all over the world. They are under siege from unscrupulous governments, mining, drilling, dams, logging and development. Rather than being empowered to use their ecological wisdom and understanding to protect and restore the rain forests, indigenous people face persecution in many corners of the world: murder, abuse and human rights violations: including here in Peru. In September this year, in the Ucayali province to the west of Lima, Edwin Chota Valera, Leoncio Quincima Meléndez, Jorge Ríos Pérez and Francisco Pinedo of the Ashéninka tribe were murdered. Valera was the chief of the Ashéninka. They were killed for defending the rainforest that their communities depend on. Perez's daughter told Newsweek, "It feels like a knife in my heart. Nothing will cure it. It will last forever. My father fought, and we will go on until we get change or we die." As natural resources become scarcer, and the pressure upon them increases with increasing population, disputes over land rights, particularly where oil exploration, hydroelectric, mining agribusiness and logging are concerned, are intensifying. Indigenous communities are particularly hard hit and their fundamental rights to life and land are violated in many countries throughout the world. I was shocked and grieved to learn on Sunday 7th December that the body of Jose Isidro Tendetza, former vice-president of the Shuar Federation of Zamora, Ecuador, had been found. He had been missing since November 28th, since he set off to a meeting of campaigners against the Mirador copper mine, which is threatening to decimate the Shuar's ancestral land. That same Sunday I met with Ecuadorian Minister of the Environment Lorena Tapia to urge her government to do everything in their power to investigate this terrible crime. Global Witness's Deadly Environment report, published in December 2013, named Peru as the fourth worst country in the world for such killings, with almost 60 murders since 2002. The Philippines is in third place with 67 murders, followed by Honduras in second place with 109. Brazil holds the dubious honour of first place, with 448 murders. Brazil's New Constitution of 1988 was pioneering, a significant step for indigenous peoples' rights. It called for the demarcation of all indigenous lands in Brazil by 1993. As a result thousands of forest peoples were granted the right to their ancestral land which they need for subsistence or spiritual heritage. In the past Brazil had an average of thirteen demarcations per year. Unfortunately under President Dilma Rousseff's administration, which favours development, large-scale agriculture projects, hydroelectric mega dams, plantations, drilling and mining operations, the number of demarcations has sunk to three a year. Even with demarcation, ancestral land is not safe. For many years I have been supporting the communities and indigenous people threatened by the Belo Monte, Madeira and the Tapajós Dam complexes in Brazil. I went on a fact-finding mission to Xingu and the Madeira Rivers in 2012. The dams will impact hundreds of tribes; tens of thousands of people. I published a report on the Huffington Post, titled, 'Belo Monte: An Environmental Crime.' I urge you to read it. The Brazilian Government appears to have abandoned its people in the name of profit, energy and 'development.' In the Tapajós basin, in the heart of the Amazon, the government plans to construct up to 29 large dams, following the same destructive model as Belo Monte. One tribe in the region, the Mundukuru, a proud warrior tribe, are continuing to resist the planned Tapajós development. They have decided to auto-demarcate their territory in response to the Rousseff administration's refusal to recognise their land rights. During my 2012 fact finding mission, I met with Jose Carlos Arara, leader of the Arara tribe. He said to me: "The government does not tell us the truth or listen to us. They are not complying with the laws of the land and they are not respecting our rights. Our survival is now in the hands of the government and Norte Energia. The Brazilian government is only thinking about profit and growth. The Belo Monte will take away our autonomy and our right to survive." I also met with Dr Erwin Kraütler the Bishop of the Xingu. He said to me, "Belo Monte will be an apocalypse for the Amazon. And the Amazon is important for the world climate. It will have consequences not only for Brazil but for the world. I cannot agree -- not only as a bishop, but as a man -- I cannot agree with this decision, which threatens the survival of future generations." The Brazilian government has used the legal mechanism of Security Suspension" or "Suspensão de Segurança," to allow them to steamroll its own laws and constitution. 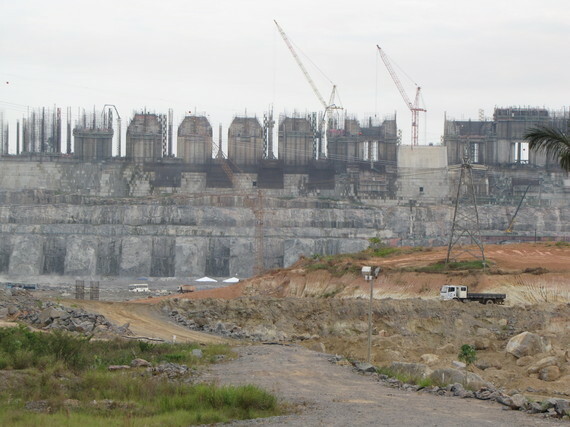 Citing the dubious rationale of national security, threatening blackouts and energy crises, the government has been allowed to arbitrarily and repeatedly overturn legal rulings that would have paralyzed Belo Monte and several other dam projects which are currently under construction. In Brazil on the 9th December 2014 the Proposed Constitutional Amendment 215 (PEC 215) was debated in parliament. This Amendment If approved, would transfer authority to demarcate lands from the Executive to Legislative branch. The Amendment would prohibit ancestral land demarcations of indigenous territories. If this Amendment goes through, the Ruralista - a conservative bloc that represents the country's growing agribusiness sector would have the decision making power. The debate has been postponed until next week. If it passes, this is a deeply troubling development. 412 dams are planned across the Amazon rainforest. 256 of them are in Brazil, 77 in Peru, 55 in Ecuador, 14 in Bolivia, six in Venezuela, two in Guyana, and one each in Colombia, French Guyana and Surinam. Five of the six rivers which run through the world's largest tropical forest will be dammed - and damned. All over Brazil, even now, the Amazon's waterways are being blocked and diverted. The river system that provides almost a quarter of the world's fresh water is being dammed, polluted and fouled up. The dams being built throughout South America present a threat to millions of indigenous people. In Brazil alone, 80,000 people will be displaced. Those who are most affected by these dams are the communities and indigenous people, who live in the surrounding areas. These megadams are threatening their survival, way of life and culture. All countries must comply with Article 169 of the International Labour Organization's Convention. It is imperative that indigenous rights, including the right to 'free, prior and informed consent,' are respected. Indigenous peoples' land and territorial rights must be protected in accordance with the United Nations Declaration on the Rights of Indigenous Peoples (UNDRIP) and with State obligations under related human rights instruments. I cannot understand why the Latin American countries where megadams are planned, do not opt for renewable energy instead of building these costly - both economically and in terms of human rights - dams. Everything these governments claim that these megadams will deliver could instead be achieved with renewable energy, which would not have the same devastating impact on this vast, fragile ecosystem. Renewable energy is not merely the solution to Latin America's mounting energy needs: it is the solution to all our needs. Promoting renewable energy must now become a global and universal priority. These technologies are the only viable solution to the imminent energy crisis. Nothing is macro-economically more necessary, more practical or cheaper than the conversion of our energy systems from conventional energies to renewable energy. 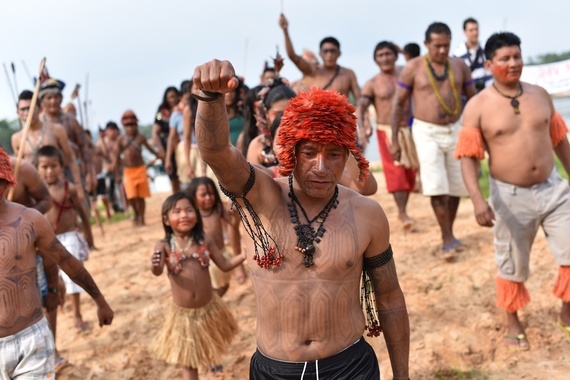 It's not just megadams which are threatening indigenous people and the Amazon. As COP20 drags on inside the military compound which the Guardian newspaper refers to as a 'climate fortress,' there are human rights and environmental disasters happening in Peru. The Peruvian government is pursuing expansion of oil and gas operations in the Amazon. Two of the spills are clearly visible from the air: dark scars across the green forest. Indigenous communities nearby report illness in their children; dead fish and the corpses of small animals are clogging up the river. Such activities by governments and corporations are egregious human rights violations. They cause irreparable and irreversible damage to the environment and accelerate climate change. Greg Asner of the Carnegie Institution for Science found, in a report published this week in the Proceedings of the National Academy of Sciences, that "nearly a billion metric tons of above-ground carbon stocks in Peru are at imminent risk for emission into the atmosphere due to land uses such as fossil fuel oil exploration, cattle ranching, oil palm plantations and gold mining." Resistance to granting indigenous peoples rights to their ancestral land is motivated by profit. Many governments know that beneath indigenous lands lie great reserves of fossil fuels and minerals and they are willing to sacrifice lives and the environment to access them. The Peruvian government is not the only one exploring for oil in the Amazon. The Biosphere of Yasuni National Park in Ecuador is home to a record number of animal and plant species, not to mention the Tagaeri and Taromenane clans of the Waorani, whose ancestral lands sit atop Ecuador's largest undeveloped oil reserves. 90% of the Ecuadorian population opposes the move to drill, but President Correa insists he has 'no choice.' By 2016, a subsidiary of the national oil company, Petroamazonas will be drilling in Yasuni Ishpingo-Tambococha-Tiputinin (ITT) block, an untouched swathe of primary rainforest covering around 100,000 hectares. The Guardian newspaper alleges that Ecuador has negotiated a secret deal with Chinese bank over ITT's oil. The BJHRF and I also have been supporting the Mayangna people in their struggle to protect their ancestral land - the Biosphere Reserve of Bosawás in Nicaragua, the second largest rain forest in the western hemisphere, home to approximately 40,000 indigenous Mayangna. Bosawás is part of Nicaragua's national patrimony - a unique preserve of indigenous culture. The lives of the Mayangna and Bosawás's unique ecosystems are threatened by invasions of illegal loggers and settlers. The Mayangna leader Charley Taylor was killed on April 24th 2013, trying to defend his lands from loggers, who had cleared 35 acres of precious hardwoods. These invaders have deforested around 150,000 hectares since 2009, are polluting the rivers and threatening the Mayangna people. If these illegal activities are allowed to continue, in ten years Bosawás may no longer exist. I have appealed to President Daniel Ortega to declare a state of emergency in Bosawás. The Government of Peru announced on December 8th, gender day here at the COP, that Peru will become the first country in South America to incorporate a Climate Change Gender Action Plan into its national climate policy and planning, and the 14th country in the world to do so. This is wonderful news. I met some extraordinary and courageous women indigenous leaders when I spoke at the WECAN event, Women on the Frontlines of Climate Change, on December 8th. Patricia Gualinga, the Kichwa leader from Sarayaku, Ecuador, Ruth Buendia, an Asháninka Leader from Peru, Alicia Cahuiya Iteca of the Huaroni, Ecuador, Tantoo Cardinal of the Tar Sands in Canada among many others. These are inspiring women, standing up to defend the rights of future generations, they are unflinching defenders of their people and their ancestral lands. Some of them spoke about Pachamama, the goddess of nature and balance who is honoured here in Peru, and across South America You could translate Pachamama as Mother Earth but it's more than that. 'Pacha' means more than "earth" - the word also implies the cosmos, universe, time, space... We can't translate Pachamama literally into English, but perhaps a better attempt would be Mother World. I urge the COP to remember Pachamana and her rights. What's at stake is our future, and that of future generations. Unfortunately women are underrepresented in UNFCCC negotiations, at all the COPs. The UNFCCC has a terrible track record with gender equality. The term wasn't mentioned in documents until 2007. Gender equality isn't mentioned in the ADP text. The Philippines human rights language I mentioned earlier, pushed by Ghana and Mexico, would right this omission. This is woefully inadequate. Climate change is an issue of gender equality. In addition there has been shameful compromise in the Subsidiary Body for Implementation SBI two year work programme to advance gender. The SBI work programme was decided in Warsaw, and was a welcome step forward. But this week, in a travesty of cowardly wording, the term 'gender equality' was replaced by 'gender balance' in the text of the SBI decision on the Work Progamme on Gender, at the behest of Saudi Arabia. Gender balance is a purely numerical term. It has nothing to do with equality. Gender equality is mentioned once in the Decision, in a context that negates it. I urge you to read Diego Ortiz's excellent analysis regarding this on the blog adoptanegotiator. Mexico remained the only country which continued to push for the term 'gender equality' to be used throughout the text. This is a fatal step back for gender equality. I am appalled. My only hope is that the COP reopens the topic in Paris. I am very concerned. What would this mean for gender equality at the UN, in the global climate agreement, and for future generations? We need to achieve a legally binding global climate treaty at COP21 in Paris next year. Failure is not an option. In order to do so we need to reach an equitable agreement on the INDCs now, and agree a draft text that paves the way. 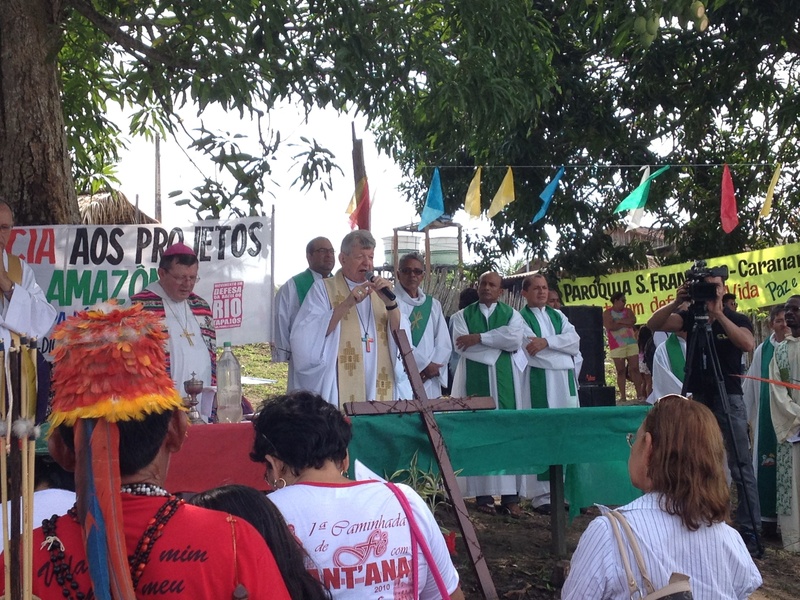 It is an example of the bizarre nature of the negotiations at COP20 that, at least this week, the Catholic Church seems to have expressed more progressive views on climate change than most representatives of government here at the UN Climate Conference. As I write, we're still waiting for an outcome, here at COP20. Now and then, above the din of traffic and the chatter you can hear the squawks of parakeets. At past COPs pressure from the US and other developed countries to cut proceedings short, decision, or no decision, has resulted in a failure to reach an agreement. This tactic was being employed again at COP20. When US representative Todd Stern spoke this morning he warned of the 'hour glass running out,' that failure to accept the draft text could jeopardise the UNFCCC's status. I hope for once the countries can have the courage of their convictions and emerge from COP20 with a concrete outcome. I hope the delegates don't let schedules and timekeeping become the determining factor, once again. Unfortunately I have witnessed the failure of the COPs too often to hold out much hope. Let's hope that Paris brings the change we need.